International Mowers is adding the new V-Ride stand on mower to its portfolio of Scag mowing machines. 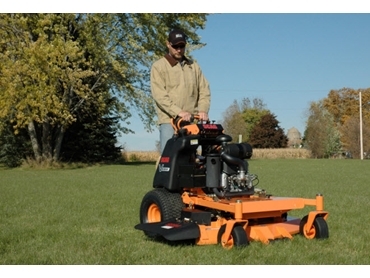 The stand on mowers are compact and have been designed to offer comfort and stability to the operator. They are convenient, agile and fast as well as space saving. The stand on mower’s operator platform benefits from 3.5 inch spring coil suspension, helping to absorb bumps and protect the operator’s back and knees. The operator platform has 12 different adjustable positions to suit a variety of sizes and riding preferences.